Because our business is so roundly and vertically integrated, we’re well-positioned for growth and surges in B2B and B2C e-commerce solutions. We can build out and manage the platform, tap into strategic partnerships for collaborative expertise, provide product and account service, and manage all aspects of fulfillment and warehousing. We can bring you, in other words, a soup-to-nuts range of services. Wanting to streamline its e-commerce interchange with vendors and distributors, Coca-Cola asked Ritway, in 2009, to collaborate with them in the development of an omnibus site for ordering marketing materials, premiums, gear and iconic merchandise. Ritway responded with a proprietary platform which showcases offerings according to department and offers daily reporting and scalability to meet the unique needs of both The Coca-Cola Company management and every day users of the site. 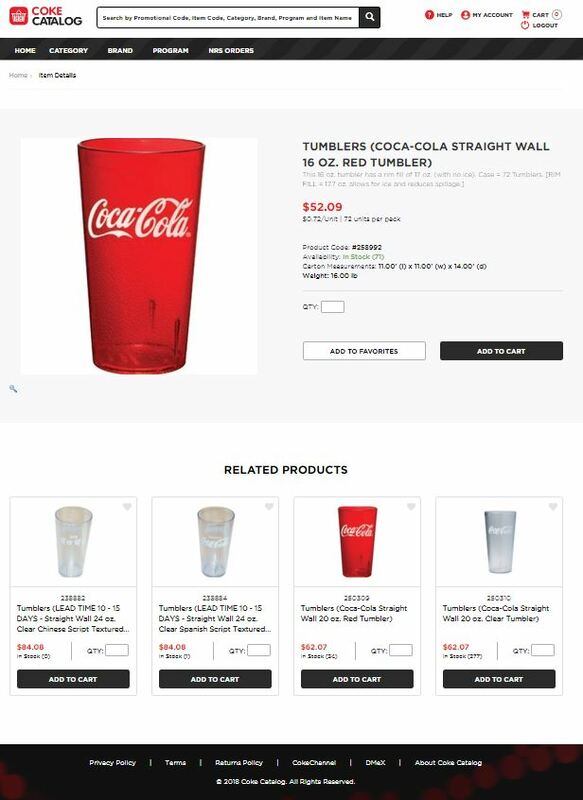 With over 5,100 registered users and over 4,000 unique SKU’s, Coke Catalog is a prestigious and efficient website that demonstrates the strong partnership we strive to maintain with each of our clients. This B2B e-commerce platform has been widely accepted by both client and shopper while providing a wide range of merchandising items for customers in ten countries. Together, Coca-Cola and Ritway have redefined the way these materials are ordered, processed, and shipped and have elevated strategic plans to move the business to the next level. Cost Savings: Eliminate paper and outdated order entry, reducing labor costs. Reduced Returns: Increase shopping visibility for available items while you ensure correct order placement and offer validation. Improved Shipping Accuracy: Detailed shipping instructions to assist with proper pick-and-pack procedures and reduce errors. User-Friendly Architecture: Establish a fully integrated, self-service website that is open 24/7 and designed with your users in mind. Increased Marketing Efficiencies: Build an evolving platform to correlate with specials and promotions as well as the site itself. Improved Service and Support: Provide onsite support for immediate answers and staffing solutions for more complex inquiries. Reporting Dashboards: Set out cooperative administrative controls for inventory, order, and financial management that provide transverse analysis for a united partnership.